When was the South Branch of the CNJ (Somerville - Three Bridges) abandoned? Stop in the store and give us your answer. We would love to see you. 19G @ 7:15 passing through Bloomsbury with 138 cars of mixed freight. Motive power would be NS 7565 (ES40DC) and NS 9199 (C40-9W). 212 @ 7:55 would have NS 8720 (C40-8) and NS 9126 (C40-9W). 23M @ 8:07 would leave the controlled siding at MP 67 and head west with its cargo of mostly K Line containers after 212 passed by. NS 9964 (C40-9W), NS 7138 (GP60) and NS 7141 (GP60) provided the power. At Flemington Junction, NS 11J, with NS 7522 (ES40DC) and NS 2712 (SD70M-2), would head west with eighty-six autoracks. 24Z @ 10:20 would have two SD70M-2s, NS 2760 and NS 2766, as its power on this day. Photos below are from the Somerville Street Fair held on Sunday, 6/2/07. 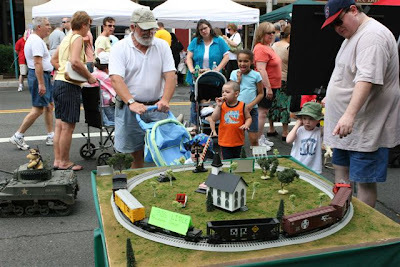 We had a small train layout set up in the street in front of the store. 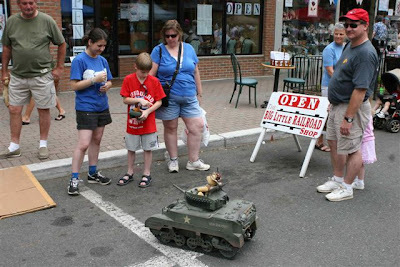 We also had a couple of RC tanks running in the street. The kids all had a good time. 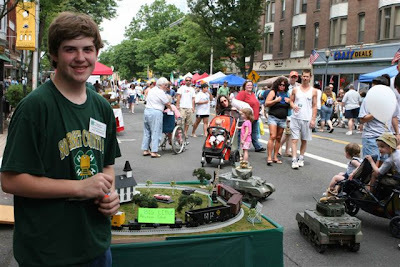 In the last photo, note the young man's T-shirt for the Somerset County 4H Trainmasters. We support this club, and if you contact us we can tell you more about them. Next Somerville Street Fair will be on Sunday, 10/7/07. Come on down! 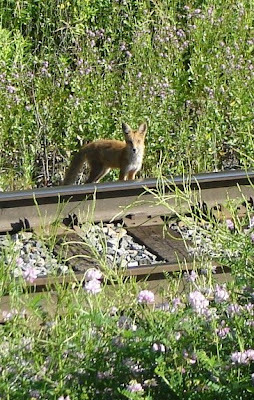 Pic taken on 6/1/07 by KC Tweed. 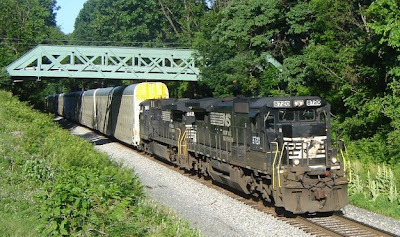 Norfolk Southern Corp. announced today plans for a $2 billion rail corridor to speed shipments of cargo containers between the central Southeast and the Northeast. 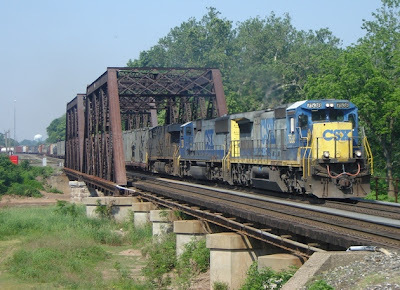 The project, dubbed the Crescent Corridor, involves upgrading and expanding the Norfolk-based railroad's rail network along a route stretching from Louisiana to New Jersey, purchasing new locomotives and railcars, and building new terminals in Maryland and Tennessee. It is even more ambitious than the $309 million Heartland Corridor project that is being built to shorten train ships between the port of Hampton Roads and the Midwest. 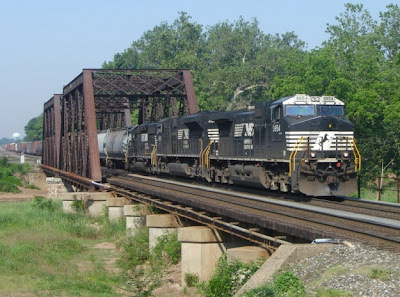 Like the Heartland Corridor, Norfolk Southern plans to rely heavily on public dollars. The project would divert much truck traffic from highways, producing such public benefits as reduced highway congestion and vehicle emissions, Mike McClellan, Norfolk Southern's vice president of intermodal and automotive marketing, told a Wall Street conference today. Public bodies should pay for those benefits, he said. Already, Virginia has committed $40 million for the project, which would run along Interstate 81, a main truck route, McClellan said. If the financing comes together, construction on the Crescent Corridor would begin in 2008, with the first part being completed by 2009. he said. 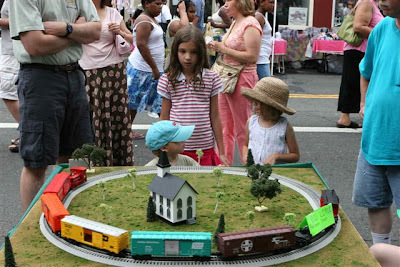 The project would be finished by 2013.
as being trackside along the Lehigh Line in Manville (NJ) with the three H's (heat, haze and humidity) certainly made it feel like summer on this Thursday morning. Here was the rundown of what passed by my vantage point. NS 21M @ 7:20; had a trio of C40-9Ws for power. They were NS 9977, NS 9978 and NS 9398. NS 212 @ 8:07; had two C40-9Ws, NS 9407 and NS 9059, for power. NS 18G @ 9:15; had NS 9954 (C40-9W) as the leader, NS 2690 (SD70M-2) and NS 3376 (SD40-2, ex-CR 6438) for power on this mixed freight. NS 11J @ 9:22; would proceed to head west after holding on the passing siding for 18G to pass. 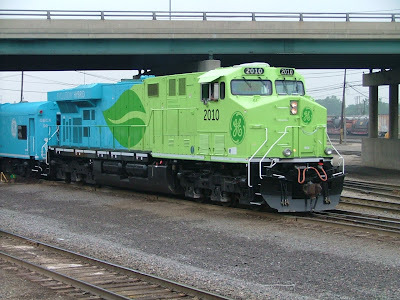 Motive power would be NS 7620 (ES40DC) and NS 8813 (C40-9). Behind them were sixty-three autoracks. CSX Q300 @ 9:54; After dropping off six cars at the Manville yard, Q300 would head east with CSX 7538 (C40-8), CSX 709 (SD70MAC) and CSX 5228 (ES44DC). As to when the calendar declares summer officially arrives, that will happen on June 21st.